This entry was posted in RC Helicopters, Uncategorized on January 17, 2012 by ian. With our work on SenseArray we are in the fortunate position to apply machine learning to a wide variety of fascinating real-world problems, as diverse as predicting the likelihood that two people will have a successful date, the probability that someone will click on an ad, or the likelihood that a credit card transaction is fraudulent. Sometimes all you care about is that predictions are correct relative to each-other. You’re looking for the best ad, or the best match on a dating website. But in other situations you need an actual probability, not just a “score”. We quickly learned that it is dangerous, and frequently just plain wrong to assume that the output of your predictive model is a reliable probability. As a specific example of this, imagine that you are using your predictive model to bid for the right to show someone an ad through an ad exchange. To do this you need to determine how much you expect to make if you show them the ad, and this depends on the probability of them click on it, and perhaps the probability of them making a purchase later. In this situation it is critical that your probabilities are really probabilities or you’ll end up bidding too much, or not enough. The first time we saw this we identified it as a form of “selection bias”, which is described in this paper (#1): Tweedie’s Formula and Selection Bias. Essentially the paper states that if you are using predictions to pick things, perhaps the likelihood that someone will click on an ad, then the mean of the predictions that you pick will be higher than the actual rate at which people click on the ads. The reason for this, briefly, is that you are more likely to pick predictions with a positive error rather than a negative error, which creates an overall positive bias in the errors of what you’ve picked. Paper #1 does a better job of explaining. Yesterday during a discussion on Reddit the aptly named Mr_Smartypants directed my attention to paper #2: Transforming Classifier Scores into Accurate Multiclass Probability Estimates, which describes another reason that you can’t treat the predictions of many learning algorithms as probabilities (see Figure 1 from the paper). This particular problem doesn’t affect SenseArray because it operates in a fundamentally different way to most machine learning algorithms, but it does affect most other supervised learning systems that produce a probability as output. This is fine if all you care about is that the ordering of the predictions is correct (ie. the relationship between the predictions and reality is isotonic), but if you want to treat them as accurate probabilities you’re in trouble. Now, working through the list starting at the beginning, find a prediction pair where the outcome of the second is lower than the outcome of the first. This is a “violator”, because we know that a higher prediction should mean a higher outcome. In the brief example above the 2nd and 3rd prediction-outcome pairs are violators because while 0.6 is greater than 0.5, 0 is not greater than 1. We carry on through the list doing this every time we find a pair of violators. At the end of this process, we are guaranteed to have an isotonic mapping from predictions to outcomes. Yay! The basic idea was for the “real life” probabilities to be the square of the prediction. So, if the prediction was 0.5, the real probability would be 0.25, and so-on. As you can see, it is a terrible fit, completely useless for our purposes. What went wrong? (edit: Turns out that paper #2’s description of the PAV algorithm was incorrect, my modification to it was actually the correct implementation). After some thought I had an idea. Recall that the PAV algorithm works by “merging” pairs of samples repeatedly, using the average prediction and outcome of each to produce the replacement sample. 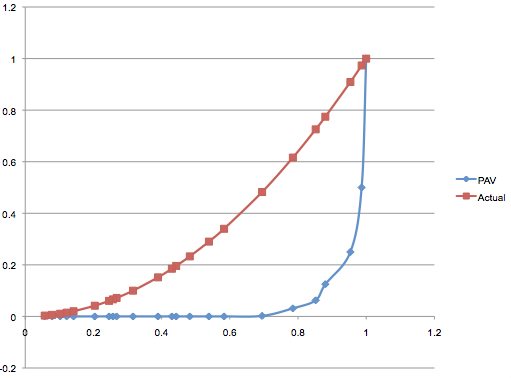 Using the average in this way assumes that both of the “parent” samples are of equal value, but are they? Well, no. One parent sample might have hundreds of “ancestor” samples, while another might not have any parents at all. PAV ignores this. The result is that samples in parts of the curve that have a lot of these violations effectively get “watered down”, while samples in parts of the curve with few violations do not. 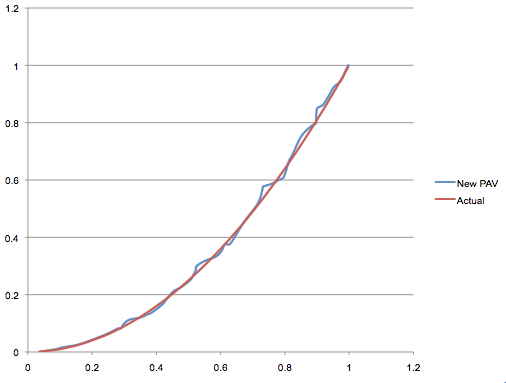 The effect is to distort the shape of the curve, something that is very obvious from my experiment above. The solution? We need to keep track of a “weight” for every sample, which basically counts the number of “original” samples that they are composed of. Now, instead of doing a normal averaging of two parent samples, we do a weighted average, and the resulting child weight is the sum of the two parent’s weights. Wow, looks like we have solved the problem! Frankly, I’m surprised that people haven’t noticed this flaw in the PAV algorithm in the past (edit: it wasn’t a flaw in the algorithm, it was a flaw in paper #2’s description of the algorithm). I assume that they were using it in situations where the violations were evenly distributed throughout the prediction curve, in which case the distortion may not be so pronounced. I’ve emailed the authors of paper #2 and will update this post once I hear back from them. Update: Ronny commented below directing me to another paper that describes the PAV algorithm, but it describes it with my “fix”. It appears that the description of the algorithm’s implementation in paper #2 was incorrect, and the correct implementation is the weighted approach I describe above. I suspected this might be the case, nice that it’s been confirmed. This entry was posted in AI on November 23, 2011 by ian. Find more similar graphs on the USGS website. This entry was posted in General on November 22, 2011 by ian. In fact, its what you’d expect, surprisingly so in fact. Since the supply of new Bitcoins is regulated such that it is essentially constant, you’d expect the value of a Bitcoin to grown and shrink in proportion to the rate at which people are seeking to acquire Bitcoins. 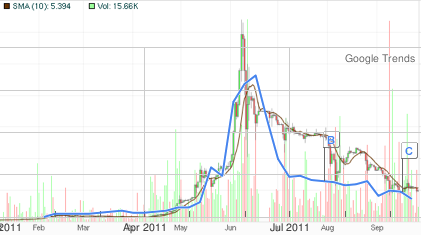 This entry was posted in Bitcoin on September 27, 2011 by ian. There are two main R/C flight simulators on the market, RealFight and Phoenix. I purchased RealFlight over a year ago, and recently purchased Phoenix, so I’m in a good position to compare them. Both Phoenix and RealFlight are Windows software, although I use both of them on a Mac using Parallels. This works reasonably well provided that I’m careful to avoid running any other CPU intensive software at the same time. Even then both software packages exhibit occasional slow-downs during which the visuals and audio can “stutter”. Of the two, Phoenix seems less vulnerable to this. RealFlight comes with its own dedicated controller, whereas Phoenix comes with a cable that will connect to most common controllers including Spektrum. If your controller isn’t supported, you can buy a cable that will work with other controller types. I prefer the Phoenix approach as it lets you fly with the same controller that you fly your aircraft with, which helps you get accustomed to the feel of it. Phoenix also comes with a better selection of models, including popular brands like eFlite and Align T-Rex. More recent versions of RealFlight may now come with a better selection, but when I bought it (version 4.5) I didn’t recognize any of the brands it supported out of the box. One thing RealFlight can do that Phoenix cannot is to offer a wider variety of viewing angles, in particular a “cockpit” view. This is probably not especially useful for most people, unless you need to practice FPV flying (something I could see myself getting into sooner or later). And price? At the time of writing RealFlight is $199.98 and Phoenix is $129.99. The price difference may be partially explained by the need for RealFlight to bundle its own controller. Still, I think Phoenix wins on pricing. This entry was posted in RC Helicopters on September 1, 2011 by ian.